CHAMPAIGN, Ill. — Bacteria in tap water can multiply when a faucet isn't used for a few days, such as when a house is vacant over a week's vacation, a new study from University of Illinois engineers found. The study suggests a new method to show how microbial communities, including those responsible for illnesses like Legionnaires' disease, may assemble inside the plumbing systems of homes and public buildings. The findings are published in Nature's ISME Journal: Multidisciplinary Journal of Microbial Ecology. 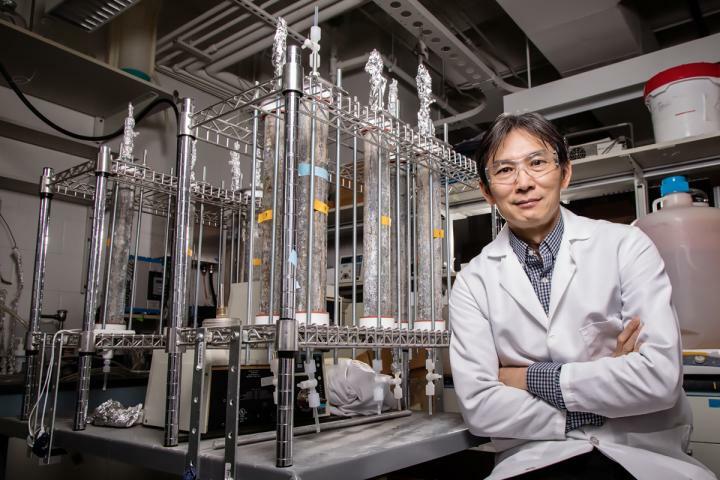 "Previous studies have relied on reproducing the conditions of a stagnant plumbing system within a lab setting," said co-author and civil and environmental engineering professor Wen-Tso Liu . "We were able to collect samples in a real-life situation." "We performed a variety of analyses, including tests to determine the concentration of bacteria present in the before- and after-building-closure samples," Liu said. "Our results suggest that the increase in bacteria in the post-stagnation samples is a result of something occurring in the interior plumbing, not the outside city source, and in pipe segments closest to the taps," Liu said. The researchers determined the city water biofilm composition by sampling the interior parts of water meters that are routinely collected during the water utility's replacement program. Liu worked with the municipal water company to collect almost four years' worth of discarded water meters, giving the team a large set of city biofilm data. By combining the before- and after-stagnation data, the city biofilm "control" data and information from building blueprints, the team developed a model to test water quality inside almost any building. "We only need two samples – one before stagnation and one after – and we can determine how extensive the microbe growth is inside in-premise pipes, and we can now do so without destroying property," Liu said. "It is contrary to what we have learned about conserving water, but I like to think of it as just another basic hygiene step," Liu said. "We have made a habit out of washing our hands; I think we can make a habit out of running the tap for few moments before use as well." "Communities have been and will continue to invest in green infrastructure that stresses water conservation," Liu said. "If interior plumbing were to become contaminated with harmful bacteria, that could lead to unforeseen public health problems when buildings are left vacant for more than a few days." The desire to reuse and recycle water is unlikely to go away anytime soon, Liu said. "How are we going to deal with the problem when combined with water-conservation practices? If we want to head toward green practices, our engineers, public health organizations, scientists and municipal water suppliers will need to work cooperatively." The U. of I. – King Abdullah University of Science and Technology joint research program, the Water Research Foundation, Illinois American Water, U. of I. Facilities and Services and the Alfred P. Sloan Foundation Microbiome of the Built Environment Postdoctoral Fellowship supported this study.